Take a test on you politicians, how much fascism is there in them? 1. Forward is Backward. Fascists insist that everything necessary for human life was already discovered in the past and only needs to be properly interpreted by contemporary leaders. 2. Progress is Evil. The new is not only not needed but is dangerous in the minds of fascists who are prepared to rely on technical breakthroughs only to maintain or even restore the past. 3. Only Fools Think. For fascists, members of the intelligentsia are “potentially dangerous” and thus must be marginalized and eventually destroyed. 4. He who is Not with Us is Against Us. Fascists view any display of independent thinking as a betrayal and as a challenge to their efforts to stupefy the population. 5. The Foreigner is the Enemy. Fascists seek to unify society by promoting fear and hatred of the outsider. 6. Strength is with the Failures. Fascists have always understood that those who are doing well are less likely to be mobilized against this or that outsider group than those who are not and who need that sense of hostility in order to feel themselves exceptional and superior. 7. The Country is Threatened by a Worldwide Conspiracy. Fascists have always explained any shortcomings by pointing to the existence of an active and remarkably effective conspiracy of one kind or another. 10. Plebes and Patricians. Fascist regimes are like a staircase, with the denizens of each step fearing those who are above them and dreaming of occupying their place and with the top man viewing everyone below as his servants. 11. To Sacrifice Oneself is Beautiful. Fascists insist that each individual must see as his highest goal the sacrifice of himself or herself for the good of the system. 12. The Cult of the Real Man. Sooner or later, fascists arrive at the thought that they can and must get involved in sexual relationships. 13. The Voice of the People. Democracy uses the will of the people to take decisions, while fascism uses them for justifying what it has done. 14. New Speak. 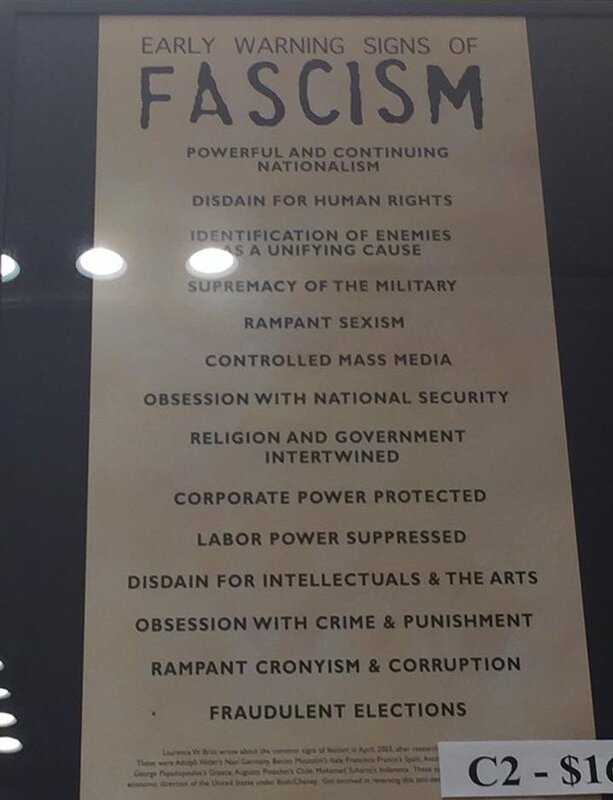 Fascism destroys language in order to destroy thought, presenting the world in black and white terms with no opportunity for nuance or discussion. And it abuses the language in another way: it refuses at least under current conditions to label itself fascist while denouncing everyone it doesn’t like as fascist.